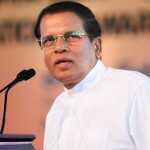 President Maithripala Sirisena has called for a meeting with senior officials of the Inland Revenue Department and the Ministry of Finance today, to review the recent Value Added Tax (VAT) hike. The meeting comes amidst increasing protests by the public against the hike, which came into effect in May this year. According to sources, Sirisena is looking at the possibility of bringing down the tax at least on certain items from it’s current 15%. Prime Minister Ranil Wickremesinghe led government increased VAT from 11% to 15% in May, resulting in the cost of living skyrocketing. In April, Srisena vowed to send home advisors who recommended a tax increase, however despite the declaration, the Government went ahead and increased VAT in May, but no officials have been sent home since then. Currently, VAT is also charged on essential medical services including in the consultation of doctors at private hospitals.